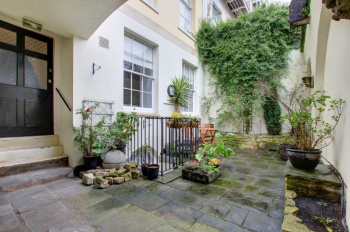 A well-appointed and stylish grade II* listed courtyard apartment of circa 1135 sq.ft. with stunning southerly facing sitting room, large kitchen/breakfast room, private courtyard rear garden set in a highly favoured side road a short distance from Clifton Village and the Clifton Suspension Bridge. 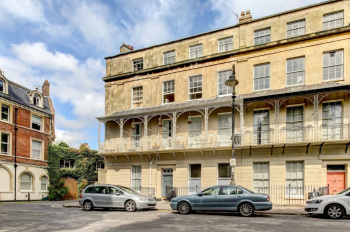 Equidistantly situated between The Mall and Clifton Suspension Bridge in an exclusive and much sought after setting, convenient for local shops, bars and restaurants. Accommodation: entrance vestibule, entrance hallway, sitting room, dining hall, kitchen, bedroom 1, bedroom 2 and family bathroom/wc. Communal front courtyard, private walled rear courtyard garden and use of The Mall gardens located in front of the property. 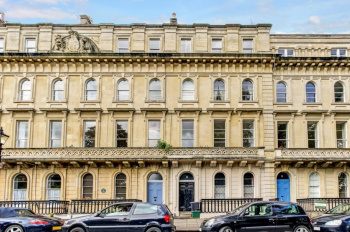 A smart and bright 2 double bedroom top floor apartment circa 1024 sq.ft. with modern and pleasing presentation throughout, set within this attractive grade II* listed terrace overlooking the tree-lined Victoria Square gardens, with spacious sitting/dining room (22'10 x 22'6), modern re-fitted kitchen/breakfast room (11'10 x 10'9). Clifton enjoys an enviable reputation with an eclectic and diverse range of boutique shops, bars, restaurants and further essential services. The apartment has a stylish and well-appointed modern fitted kitchen with a range of integrated appliances. 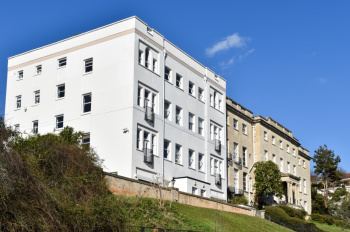 Located in the heart of Clifton Village with its variety of restaurants, cafes and independent retail units. Just a short walk from Clifton, Durdham Downs with more than 400 acres of open recreational space.